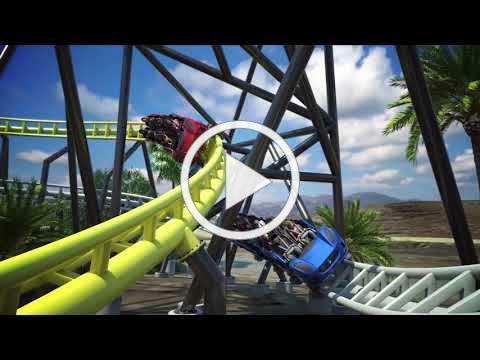 Six Flags Magic Mountain announced its record-setting 20th roller coaster, kicking off Six Flags' annual reveal of new attractions for the upcoming season. West Coast Racers will be a Premier Rides launched coaster that will send riders on a two-lap race around a refurbished and newly-themed land in the park. Featuring a Mobius-strip-style track, riders will take their first lap around the track racing the previously-loaded train, filled with visitors who are completing their second lap. Then, on their second time around the circuit, they'll race the next train. Along the way, riders will experience four launches — hitting a top speed of 55 miles per hour (90 km/hr) — three zero G rolls and a zero G stall for four total inversions, and 30 total interactions with the other train, including a"high five". And in between their laps, riders will pass again through the load station, this time on the other side, which will be themed to a "pit stop" in the shop of West Coast Customs, the car design brand that came to fame on MTV's "Pimp My Ride." If this is where you wonder if Universal should have followed this concept for its Fast & Furious ride, well, you won't be alone. With its terrain-hugging profile, West Coast Racers might remind fans of a plussed version of Premier's previous work on Backlot Stunt Coaster. West Coast Racers will be Premier's fourth coaster in Southern California, following Magic Mountain's Full Throttle, SeaWorld San Diego's Electric Eel, and Universal Studios Hollywood's Revenge of the Mummy. West Coast Racers will be built between Apocalypse and Ninja, in "a new LA centric urban-themed area where guests will enjoy a high-energy street vibe."